Loving all things Carmelite (in particular the spirituality of St. John of the Cross), wanted to share this remarkable video of a “virtual-choir” of Discalced Carmelite Nuns from around the world. They are cloistered, but through the wonders of technology, were able to join together in celebrating through this beautiful song, “Nade Te Turbe”. *This article first appeared on the Global Sisters Report, a project of National Catholic Reporter. 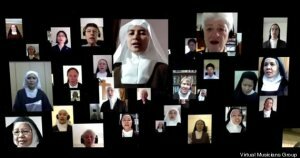 Ninety-three Discalced Carmelite nuns in 24 countries have reached out of their cloistered monasteries to sing together in a virtual choir honoring St. Teresa of Avila on the 500th anniversary of her birth. This union of voices came together through the musical vision of a Carmelite Sister in Reno, Nev., and the creative imagination of a technical wizard in the Midwest. The result is two 6-minute videos of the sisters singing on a virtual stage, created by Kansas native Scott Haines. In one video they sing Teresa’s famous words “Nada Te Turbe” (“Let Nothing Disturb You”) in an original composition by Sr. Claire Sokol of the Carmelites of Reno. In the other, some of their Carmelite friars and Secular Carmelites join them in the 11th century “Salve Regina” chant with an added descant written by Sokol. The music is hauntingly beautiful, but it is the moving collage of the Carmelites’ faces as they sing that lifts the sound to greater heights. “It took me to places within myself I didn’t know existed,” said one Carmelite after viewing “Nada Te Turbe” during its premiere in San Jose, Calif. on Aug. 22 as part of the 500th anniversary celebration by Carmelites of the western U.S. “There are no words to describe how I feel,” said another. Virtual choirs are a relatively new phenomenon. At age 22, Haines produced composer Eric Whitacre’s first virtual choir, “Sleep,” in 2009, followed in 2010 by Whitacre’s “Lux Aurumque,” which features 185 singers from 12 countries. That piece has had nearly 4.5 million views on YouTube. Haines has formed the Virtual Musicians Group to continue assembling singers from diverse locations into virtual choirs through technology. The Carmelite choir began with an email invitation from Sokol to all Carmel monasteries. By logging on to Haines’ website, any Carmelite with computer and Internet access could listen to the music, download her voice part, hear the directions of the conductor, sing and submit the audio/ video recording to Haines at his studio in Kansas City. “I think St. Teresa herself would be very enthusiastic about this,” wrote another choir member, Sister Lucia of the Risen Christ from Arnhem, the Netherlands. The choir also includes sisters from Australia, Brazil, China, Colombia, Croatia, Indonesia, Mexico, the Philippines, Singapore as well as Canada, Europe, and the United States. A few Carmelite friars joined in the “Salve Regina” choir as did some Secular Carmelites who submitted recordings made in their homes. James Savage, music director of St. James Cathedral in Seattle, is the choir’s conductor. The cathedral’s 18-member Teresian Orchestra accompanied “Nade Te Turbe.” “Salve Regina” is sung a cappella. This entry was posted in Spirituality, Uncategorized and tagged Discalced Carmelite, Global Sisters Report, Nade Te Turbe, National Catholic Reporter, Salve Regina, Teresa of Avila. Bookmark the permalink.